AFD technology and light weight make this a practitioner favorite. Weighing just 4.9 oz., the ADC Adscope-Lite 612 combines the acoustic response of a traditional bell and diaphragm in a convenient, oversized, one-sided chestpiece. The compact, sculpted design features our adjustable frequency (AFD) technology, allowing you to tune the diaphragm to enhance both high- and low-frequency response. 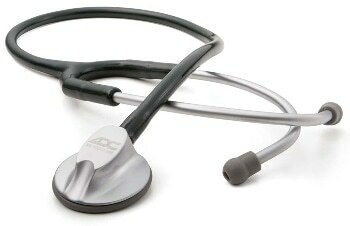 The clinician headset, designed to withstand thousands of cycles, features a double-leaf tensioning spring and a reinforcing yoke molded into flexible 22-inch PVC tubing.